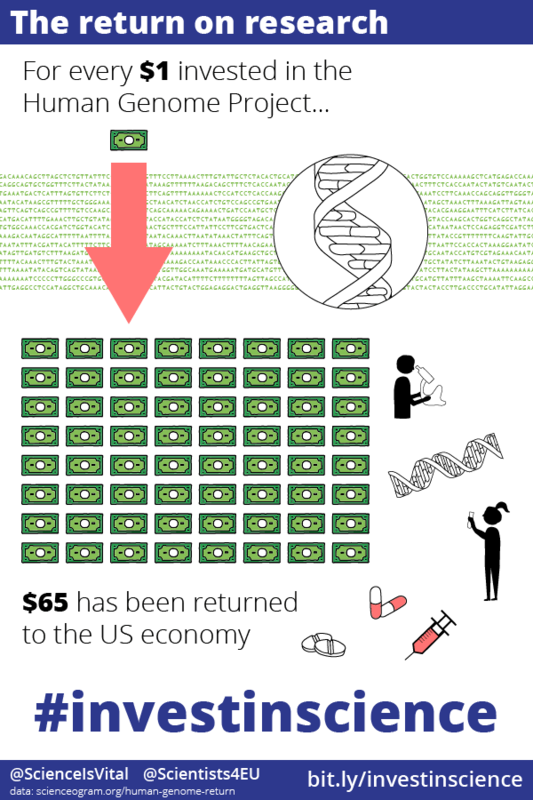 In the second of our series for Science is Vital around tomorrow’s Spending Review, we’ve created an infographic to show the return to the US economy on the Human Genome Project, and subsequent public funding of genomics research. The Human Genome Project was a huge international effort, mainly funded by the US, to read every single letter of the three-billion letter ‘human genome’—the DNA instruction manual inside each and every one of us. It concluded in 2001, but the story continued: it’s been followed by much more research, including an exponential reduction in the cost of sequencing genomes. Where the original Human Genome Project sequence cost $5.4bn to acquire (in 2012 dollars), the cost per genome is now around the $1000 mark: a ludicrous five million times cheaper, in just 15 years. The result of all this research has been a lot of economic activity. Genomics has applications from finding out more about your family tree to developing new drugs, all made possible by the blue-skies science which uncovered the sequence in the first place. The figures in our infographic come from a 2013 report by US nonprofit Battelle, which tots up the investment in the original Human Genome Project and follow-up public funding of genomics, then compares this to an estimate of the amount of economic activity generated in the US. In spite of what sounds like an eye-watering initial $5bn investment, and follow-up spending of $9bn in other genomic research, the calculated return is sixty-five times. That means that, for every dollar invested, there has been $65 of economic activity since. Obviously the process of finding out these figures is error-prone, so this number comes with a healthy uncertainty attached. However, unless this report is wildly wrong, reading the human genome was a seriously good investment. This is the economic argument for why we want the government to follow suit tomorrow, and invest in science. Science is Vital needs you! Stay up to date with their plans and find out how to get involved in new campaigns by following them on Twitter and Facebook, and signing up to the Science is Vital mailing list.